The 5:2 intermittent fasting (IF) diet, more commonly referred to simply as the 5:2 diet, has become one of the more popular diet plan in recent years. Studies have shown that the diet helps with weight loss and may also reduce insulin resistance, both of which are of particular interest for many people with type 2 diabetes or borderline diabetes. One reason for the popularity of the diet is that it allows a certain amount of flexibility, in comparison to low calorie diets, on most days of the week. The idea of the diet is that short periods of fasting prompt the body to repair damage but not enter a starvation mode of conserving energy. Whilst the theory has yet to be conclusively proved, clinical studies have shown promising results for the diet, however it has only been examined over relatively short time spans, of less than a year. The fasting days can be taken at any time during the week as long as you do not take 2 fasting days consecutively. Clinical studies have shown that the benefits of intermittent fasting are largely similar to those of a calorie restricted diets. Research has shown that periods of fasting can help to improve life expectancy and decrease risks of diseases including nerve disorders, Alzheimer’s disease and cancer. However, whether these benefits apply to a 5:2 fasting diet cannot be confirmed as long term clinical studies have yet to be performed. Is the 5:2 fast diet safe for diabetes? Whilst shorter term studies have displayed promise for intermittent fasting diets, long-term safety of the 5:2 diet is yet to be determined. As with any diet plan, you should always consult your GP or diabetes health team before making any significant changes to your diet as they could affect blood glucose levels or impact on your medication. The fact that intermittent fasting shows evidence of improving insulin sensitivity may be an attractive option for people with a BMI over 25, borderline diabetes (prediabetes) or with type 2 diabetes but not on blood sugar-lowering medications. 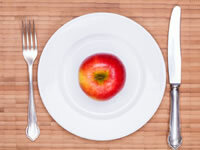 The diet may be good for people who can handle single days of significantly restricted calorie intake in preference to modest calorie restriction every day. On fasting days, the body will be forced to use stored energy from the body, fat and stored sugar (glycogen), which can help with weight loss and may improve blood glucose and cholesterol levels. If you are on insulin, or hypo causing medication, such as sulphonylureas or glinides, an intermittent fasting could significantly increase the risk of hypos. Your doctor should advise you on whether the diet is appropriate. If you have type 1 diabetes, following a 5:2 diet could make diabetes management more difficult to achieve and could significantly increase the risk of hypoglycemia. If your health team are happy for you to start an intermittent fasting diet, they may wish to monitor you more closely to reduce the likelihood of hypoglycemia or increased ketone levels occurring. What evidence is there of the benefits of this diet? A study published in 2010 reviewed 107 women, between the ages of 30 and 45, with BMI values ranging between 24 and 40. The participants were randomly assigned to one of two diets, either continuous energy restriction (CER) or intermittent energy restriction (IER). The CER dieters had a reduced calorie intake of 1,500 kcal through the week, while the IER diet group followed the 5:2 fasting plan. At the end of the study, both sets of dieters lost a similar amount of weight on average, and similar improvements were also seen in levels of triglycerides, LDL 'good' cholesterol and blood pressure. One area, however, where intermittent fasting was shown to be stronger than continuous calorie restriction was in reducing fasting insulin levels and insulin resistance. Depending on your outlook, the 5:2 diet may be seen as more or less practical than a continuously reduced calorie diet. The benefit being that on most days you needn‘t consume less than the daily recommended calorie limit. However, some people may find that calorie intakes of 500 or 600 calories a day are too low to be practical. For best results, it’s recommended to follow basic healthy eating rules, such as having a good intake of vegetables, fruit, and limiting intake of processed foods where possible. During the fasting days, you will need to rely on very low calorie meals to stay within the daily 500 or 600 calorie counts.